My breath floated out in front of me, small tufts of air freezing in that deep, dusky, indigo sky. Adrenaline pushed and weaved and coursed through my body, my feet crunching along the ice, matching the pace of my fellow climbers. The top of Hood seemed like a stone’s throw away, but I knew that deception all too well. It wasn’t my first summit attempt here, and I worked hard to throw all those memories and fears to the back of my mind as my tiny self made its way up the mountain. The first time I set my sights on climbing this mountain, I was at the peak of my physical game, but mentally, I was nowhere close. There was so much fear blocking my way. Fear of falling, fear of dying, fear of falling. On that trip we turned around halfway, brokenhearted and defeated, knowing I got in my own way. 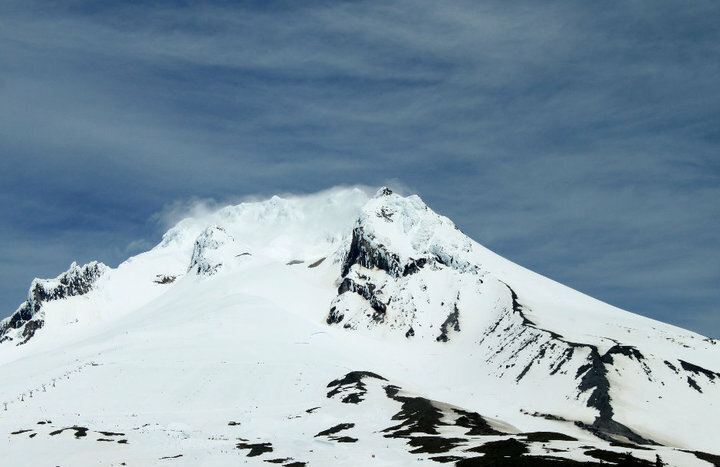 A few years later, my dad, finance and I decided to give Mount Hood another attempt, but the living, breathing mountain was ferocious in her attempts to deny us the chance. The bone-chilling fog wrapped its fingers around us and created zero visibility, and it was apparent very early on that once again, Hood wouldn’t let us reach her peak. Again, broken-hearted. I felt like this was one dream I would have to let slip through my fingers. A few weeks later, we decided to give it one more go before it got too late in the season to climb safely. I still didn’t think I would ever make it to the summit. Sitting at the base of the mountain, staring way up into the heavens seemed so far away. 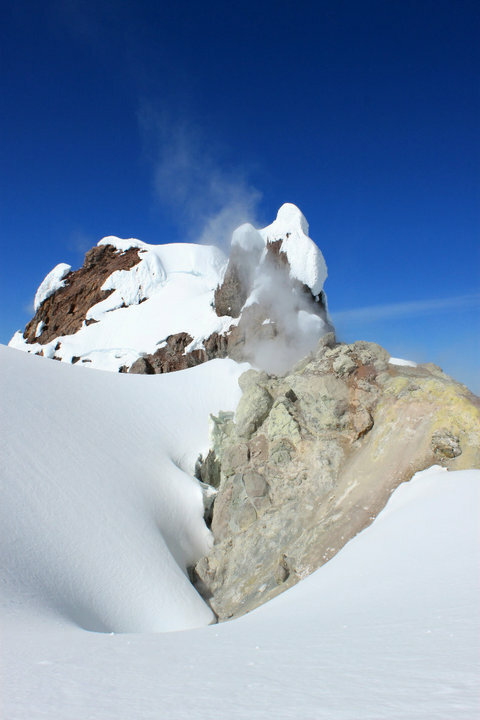 My mind wandered to the fumaroles, the crevasses, the bergschrund on the hogsback that was opened. The hundreds of ways I could fail. But at 2 a.m., I dutifully strapped on my crampons, with my ice ax tied securely to my pack, and we set off for the rising sun. My breath became regulated, my steps became routine. I pushed, and pushed, and pushed. I watched the moon set over the horizon and the sun cast duplicate shadows of the mountain on the rugged earth below. I didn’t dare look the way we came. 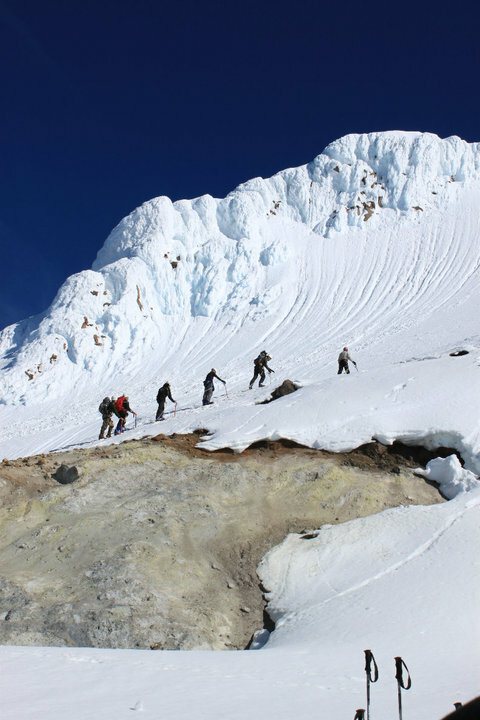 We finally reached the point of making the final summit push at an area called Crater Rock. My dad roped the three of us together again, but as he climbed up, my part of the line grew tight. The fear wrapped around me like the fog on our prior attempt, and I couldn’t move. The summit was so close, a mere 60 minutes up. But I couldn’t. The tears came. My dad’s gentle voice telling me that if we had any chance of making the summit, we needed to keep moving before the sun started melting the ice pack. I looked up, and I looked back. Stuck. My husband. My dear my husband. Where I failed myself, where I didn’t believe, he did. He climbed up to me. He wrapped his arms around me and whispered a prayer in my ear. He told me I was capable. He told me I was strong. He told me that he would never let me fall. I wiped my tears, took a breath, and set off after my Dad, up to the summit. It was steep going, we took an alternate route up the south side old crater chute, and I had to focus every bit of my energy on every single step. 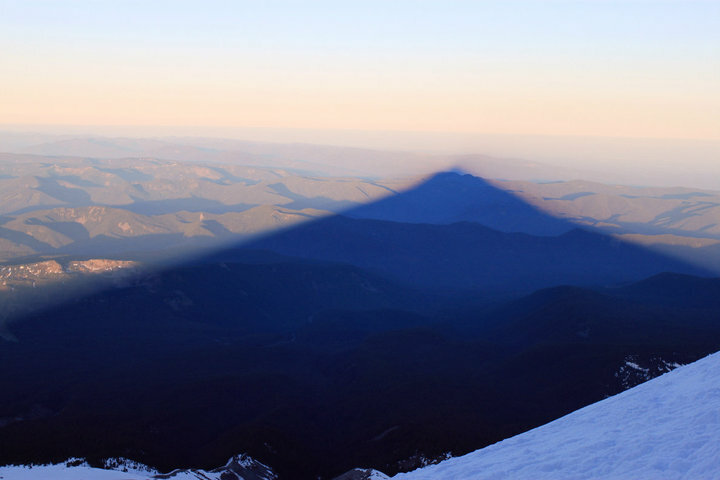 The final pitch hit was a steep angle up the chute, and with one final grasp my ax dug over the lip of a snow cap, I passed the most dangerous section and lifted myself to the summit of Mount Hood, just as beams of heavenly golden sun cast a warm glow over the ice formations. A dream achieved. Of course, with all mountain climbing, both figurative and literal, reaching the summit is only half the battle. I wish I could say I sat on the top of Oregon, breathing in the sharp, pure air and had some sort of epiphany. I didn’t do a warrior yoga pose looking out over the vast blue. I didn’t cry. I didn’t think of my life and how much mental will-power it took to get to that moment, and what that said about my growth as a person. I wish I had. Don’t get me wrong-I was smiling, but I was also shoving my face with an energy bar and guzzling water, cautiously staying away from the edge which dropped 11,250 feet straight down. With the sun rising, the snow and ice pack was getting soft, so we didn’t spend more time than necessary lingering. 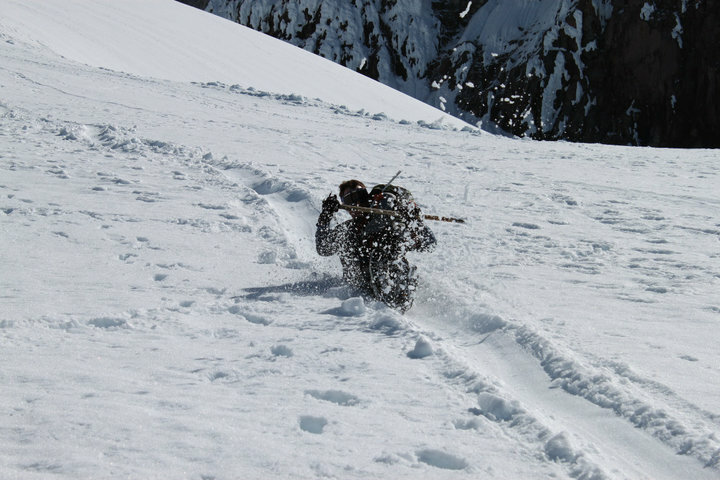 When it was our time to go with an opening down the chute, I didn’t realize how steep the pitch was until I was faced with it, side stepping and praying I wouldn’t lose my nerve or my balance. I quickly realized going down is more intimidating than climbing up! Usually, the weakest link (being me) would descend first in the rope line, with the stronger climbers behind so they can self-arrest if the weakest climber were to fall. However, I was so nervous that I couldn’t go down first, so my husband went in front of me to help talk me through and guide my steps, and my Dad, being the strongest and most experienced climber, was in the back. I literally had to keep telling myself, “stab ice axe into snow, step left foot down, pause, step right foot” (while looking for a safe spot to step), repeat, to keep myself focused on what I was doing and not what I was afraid of. I am so proud of myself. I was very scared, but I kept moving and stepping and making clear decisions. A climber above us knocked loose a large chunk of ice that came barreling down the side of the mountain, knocking me in the calves and nearly out from under myself. My dad and husband still tease me about the string of profanities that came furling out of my mouth. 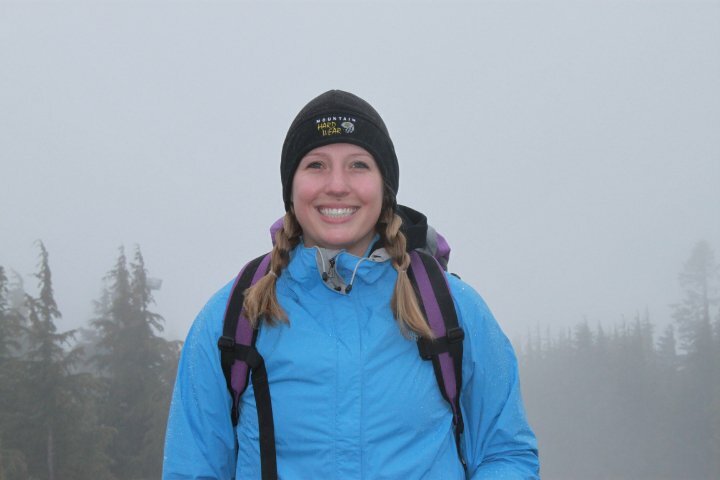 I’m fortunate that was the extent of it, for many climbers have been killed when falling chunks of ice have hit them. The rest of the trip was spent glissading down the mountain, covering so much ground, speeding along on such a high that I didn’t even notice the ice and speed had burned two holes straight through all my layers and tore the flesh straight off my buns. Of all the injuries I could have recently while climbing, two large, red, fleshy wounds that resembled road rash on my arse was not one of them! 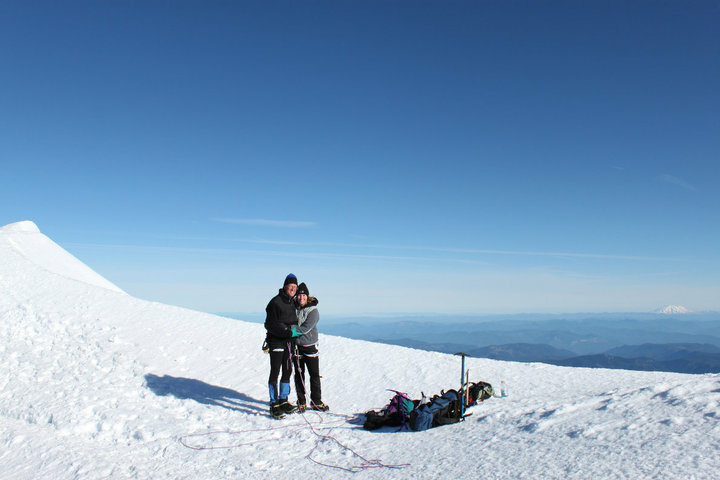 Climbing, and summiting Mount Hood was such a rewarding experience, both mentally and physically. A moment I will treasure forever. Every time we drive through Portland and see Mount Hood looming over the city, I can barely believe I stood on the very top of it. This dream achieved was a true labor of love. My dad’s experience and guidance got us to the summit, but I could never have made it had my husband not evaporated all the fear from my mind (and then later cleaned my wounds for weeks on end). Dreams are achieved when we work together. It took me three tries, but I finally did it. Good for you for persevering! Thank you Jill! I would have forever regretted had I not. What an incredible experience!! I love how the most trying times refine us so beautifully! It’s always the hard ones that make us grow, most definitely.